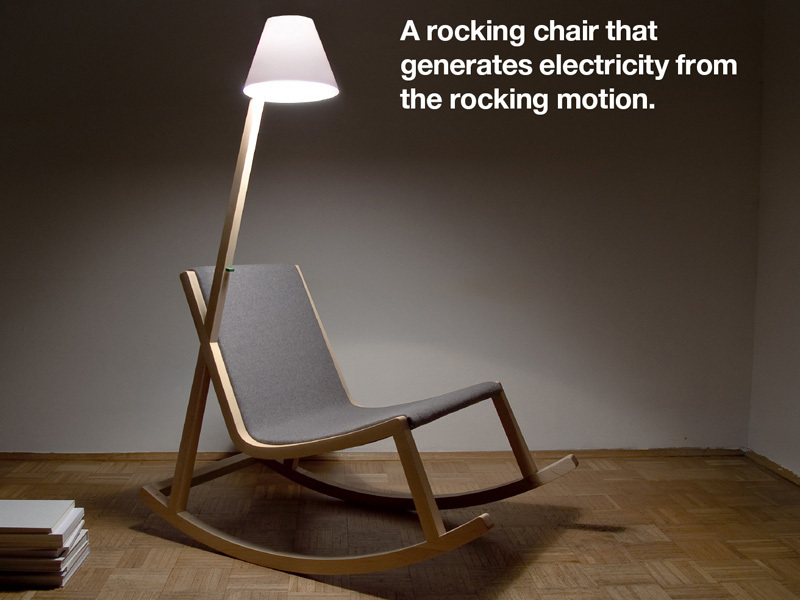 This rocking chair generates electricity from its rocking to power a built-in reading lamp. Designed by Rochus Jacob, the Murakami Chair uses “advanced nano-dynamo technology” in the skids of the chair to produce energy, which gets stored in a battery pack. A low-power OLED in the shape of a lampshade harnesses this energy. Genius bonus: you can rock to a fro as you read and since the light comes with you you don’t get those pesky swinging shadows on the page. It’s just a concept now, and when (if) they start selling I probably won’t be able to afford one. But this has inspired me to McGyver my own Budget Murakami. I’ve got a potato clock, the reading light that came with my roommate’s Snuggie and a rattan chair from my Grandmother with one short leg. This entry was posted in Gadgeteering and tagged green tech, murakami chair, nano-dynamo technology, oled, reading light, rocking chair. Bookmark the permalink. “Nano-dynamo” technology huh? Sounds very…made up. I mean futuristic. No, I mean made up.